Pat Sullivan also excelled as a college student. He earned a degree in business administration as he wrapped up his college years in 1972. He excelled so much, that he was named an Academic All-American student. Later in life, Sullivan would use his degree in business, where he worked in the insurance industry and as an executive with a tire company. He began his business career after he finished his short stint in the professional football arenas. 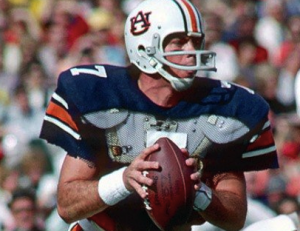 Once he finished college, Pat Sullivan was drafted by the Atlanta Falcons. He played with them for four years, before continuing on to play for the Washington Redskins. Before leaving professional football, he also played for a short period of time with the Chicago Bears and the Saskatchewan Roughriders. Sullivan returned to the football field as a coach in 1986, where he became the quarterbacks’ coach at Auburn University. He stayed there for six years, before becoming head coach at Texas Christian University. After being at Texas Christian University for several seasons, he moved onto a coaching position at the University of Alabama in Birmingham. In 2006, Sullivan became the head football coach at Samford University, where he stayed until his resignation at the end of the 2014 season. He had a remarkable influence on Samford’s football program, and his diligence helped to create a solid, fine-tuned football program. Coincidentally, the football field at Samford University is named after him. Pat Sullivan and his wife, Jean, have three children, as well as eight grandchildren. He has seen many changes within his life, and has even dealt with throat cancer too. He once stated that, “I’m like the Energizer bunny, still kicking along. But I wouldn’t be here if not for my doctors and Jean”. Furthermore, he quotes, “I’m doing all right. I have my issues to fight every day, but the good Lord has been good to me”. Sullivan is recognized by many as a football legend, and he has positively influenced many players and non-players throughout his life.